The Flesh-eater Courts get their day in the sun. No wait, that’s bad for the undead! Too late cause we’re taking a closer look at their brand new releases! Death is getting some love with this new Battletome. Nagash now has a third host of warriors to really tap into to get their full potential. 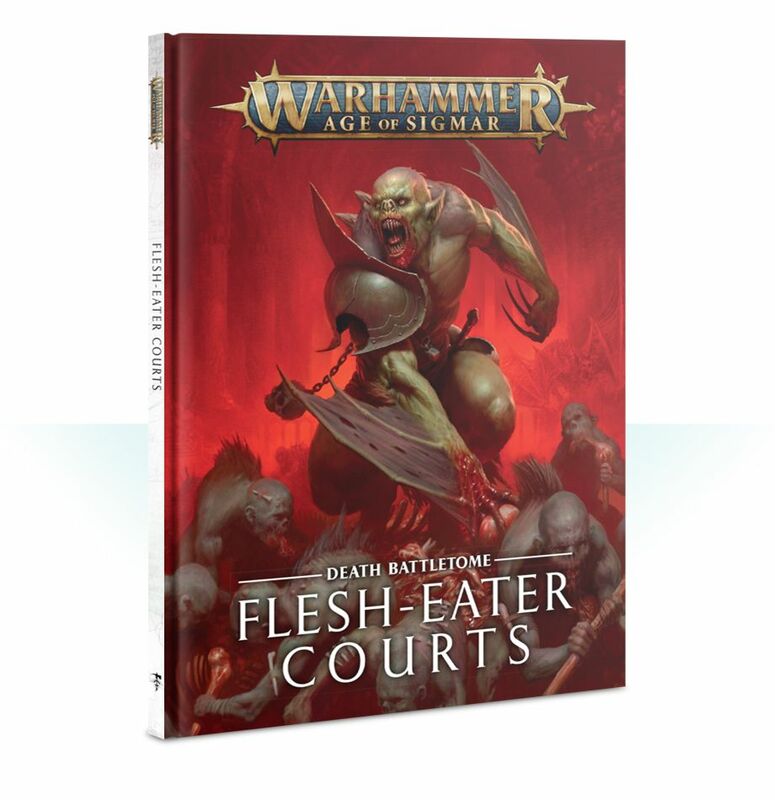 The Flesh-eater Courts bring the pain with Ghouls, Crypt-fiends, and a whole lot more with this book. It modernizes the army with a slew of tweaks and updates to their rules including updates to their warscolls, new battalion options, endless spells, a new Spell Lore, allegiance abilities, … you get the idea; It’s a new battletome! What’s really neat is that this book also introduces us to 4 new Grand Courts: Morgaunt, Hollowmourne, Blisterskin, and Gristlegore. Each of these sub-factions has their own special rules as we ll as command traits and artefacts of power. However you want to play your Flesh-eaters army, you can find a Grand Count to match your play style! The Flesh-eater Courts are also getting 3 new endless spells. What I really liked about this kit was that the spells are a different type of undead compared to the Legions of Nagash (Vampires/Skeletons) or the Nighthaunts (ghostly/ethereal). The horses, as an example, still have their fleshy-bits as well as their gore-filled insides. They are basically zombie horses vs the skeletal or ghost horses you’d see in from the other undead factions. You can tell that the Flesh-eaters are all about the blood and guts, comparatively. 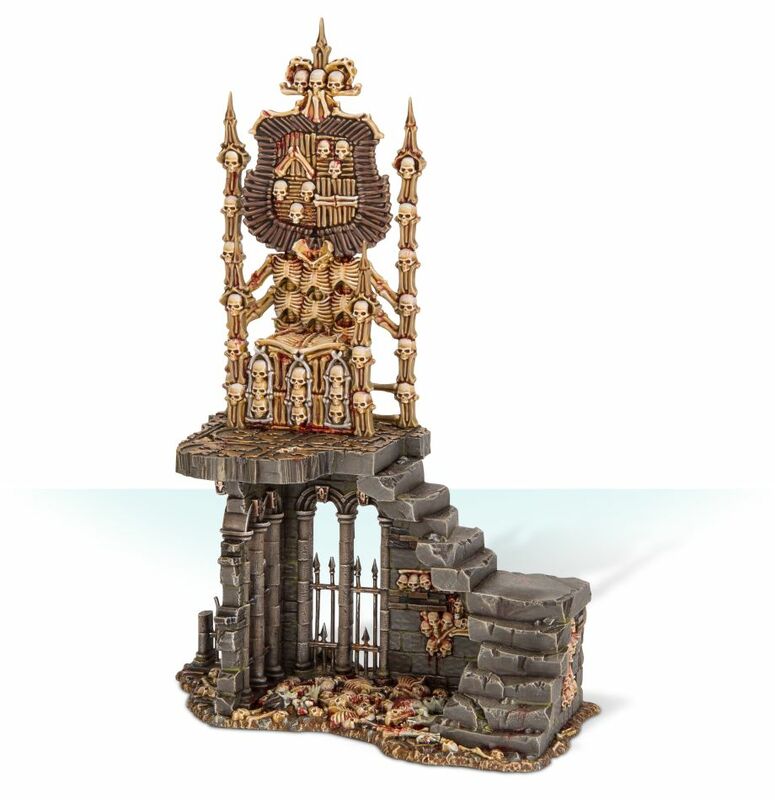 Last but certainly not least is the Charnel Throne terrain piece. You can bring it along with your forces in matched play for ZERO points and it will help boost your units. With an increase to your bravery and a decrease to your opponents, this throne is already useful. However, it can also allow your Abhorrant Archregents (the new character from Carrion Empires) to use the throne to summon more units! Who doesn’t like more undead to deal with?! The gore-seeking Flesh-eater Courts are up for pre-order this weekend – get them before they get you!